Sculptor Siegfried Puchta holds one of the Sovereign Award trophies. He sculpted the large permanent trophy and the smaller versions each winner receives. 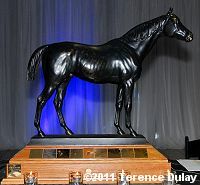 The 36th annual Sovereign Awards, saluting outstanding achievement in Canadian Thoroughbred racing and breeding in 2010, were handed out at a ceremony on Friday night at Woodbine Racetrack in Toronto. Unlike their U.S. equivalent, the Eclipse Awards, horses must have started at least 3 times in Canada to qualify (2 for juveniles). Winning connections are presented with a trophy which is a replica of English racing great St. Simon. 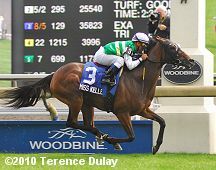 Biofuel was named Canada's Horse of the Year as well as Champion 3-Year-Old Filly for 2010. 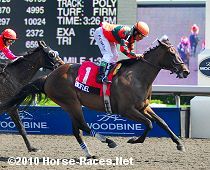 She was 4 for 4 at Woodbine, winning the Star Shoot, La Lorgnette, Belle Mahone, and Selene (G3), along with a 2nd place finish in the Coaching Club American Oaks (G1) at Saratoga and a 3rd in the Mother Goose (G1) at Belmont. 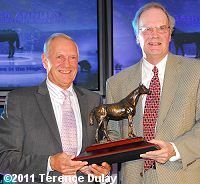 Owner-breeder Brereton C. Jones accepted both trophies. He said, "Last year was the first time I'd been to Woodbine, and when I got home I could not stop singing the praises of this place. There is no racing operation anyplace in the world today that is better managed than Woodbine. When I was growing up on a farm in West Virginia, I said I wanted to raise and race horses in Kentucky. I've done that, but now I'm asking myself maybe I should be raising and racing horses in Canada." Jones explained that Biofuel's dam, Ms. Cornstalk, had so many issues as a yearling his veterinarians advised him to not put her up for sale at Keeneland. Jones followed this advice, kept her, and bred her as an unraced 2-year-old, and her first foal was Biofuel, by Stormin Fever. 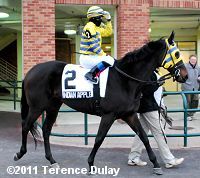 He said that he looks forward to racing both Ms. Cornstalk's and Biofuel's offspring at Woodbine in the future. Perennial champions Sam-Som Farm did not go home empty-handed, as Grand Adventure was named Champion Turf Male, off his wins in the Connaught Cup (G3) and King Edward (G2), and the farm was named Outstanding Owner, for heir 26 wins in 102 starts with $2.56 million in purse earnings. Rick Balaz, widower of the late Tammy Samuel, accepted the awards for the farm, saying he hopes the next generation will continue the family tradition that began with his late father-in-law Ernie Samuel. 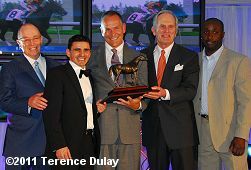 Eurico Rosa Da Silva (right) accepts the Outstanding Jockey award from retired jockey Sandy Hawley. 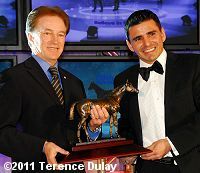 Eurico Rosa da Silva, the leading rider in Canada with 190 wins in 946 starts, as well as the regular rider of Horse of the Year Biofuel and Champion 3-Year-Old Male Big Red Mike, earned his first Sovereign Award for Outstanding Jockey. 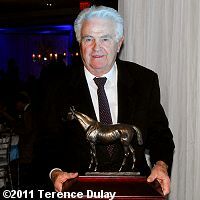 In a very emotional speech he thanked his agent Don Parente, the many top trainers and owners who have trusted him with their horses, his wife Claudia who originally brought him to Toronto, and especially the horses, who make the sport possible. The native of Sao Paulo, Brazil earned over $9 million in purses in 2010, increasing his 2009 total by $2 million. 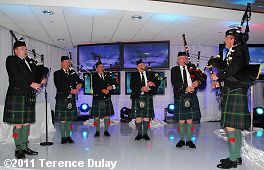 When he came up on stage as part of the Biofuel team for Horse of the Year he said his trademark "Good luck to everybody!" which he says to the live and TV audience after every winner's circle interview. Roger Attfield (left) accepts his eighth Sovereign as Outstanding Trainer from John Whitson, racing secretary at Fort Erie. Trainer Roger Attfield was on stage to accept three awards, his 8th as Outstanding Trainer, as well as for Champion Older Male Sand Cove and Champion Turf Female Miss Keller. Attfield traind all three finalists for turf female, as well as Champion Older Female Impossible Time, whose award was accepted by owner-breeder Charles Fipke. Attfield's horses won over $5 million in purse earnings, with 54 wins in 287 starts including 13 stakes in Canada and 8 in the U.S. Sand Cove won the Steady Growth, Seagram Cup (G3), Overskate, and Sir Barton in his championship season, while Miss Keller won the De La Rose at Saratoga and the Canadian (G2) at Woodbine, then finished a close second in the E.P. Taylor (G1) Impossible Time was 5 for 9 including wins in the Ballade, Victoriana, and Classy N Smart. 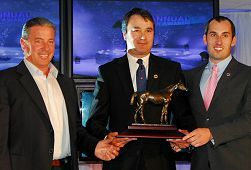 Wesley Ward (left) and Warren Burn (right) accept the Champion 2-year-old Male award for Madman Diaries from John Unger, a steward of the Jockey Club of Canada. 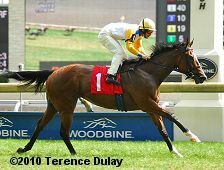 Madman Diaries was named Champion 2-Year-Old Male, after breaking his maiden at Woodbine and following that with a win in the Victoria Stakes and a 2nd place finish in the Colin Stakes, before shipping south to win the Sapling (G3) and then finished 4th in the Breeders' Cup Juvenile Turf. 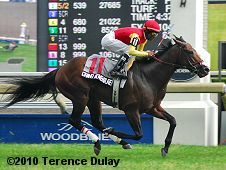 Wesley Ward bred, trained, and co-owned the Florida-bred son of Bring the Heat, and after his success with Madman Diaries, he will race a string of horses at Woodbine full-time in 2011. He said, "Everybody here is so accommodating when we come up here to race. What a beautiful place you have here for us and our horses. I wish the U.S. tracks would follow suit, what you have is fantastic." The following afternoon, Ward saddled 5 winners on the opening day card. The E.P. Taylor Award of Merit had not been awarded since 2005, but this year, named the late Robert M. Anderson as its latest recipient. The president of Anderson Farms was involved in Thoroughbred and Standardbred racing in Canada for 41 years until his death last November, and served on many boards of directors in the Canadian racing industry including Woodbine Entertainment Group, the Canadian Thoroughbred Horse Society, as well as the Thoroughbred Owners and Breeders Association in the USA. It was very fitting for him to receive the award as E.P. Taylor mentored Anderson at Windfields Farm and encouraged him to get into the racing business. David Willmot presented the trophy to Anderson's children David and Jessica immediately before Horse of the Year was presented. 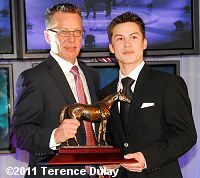 Omar Moreno (right) accepts his second consecutive Outstanding Apprentice Jockey award from Robert King, national manager of the Jockeys' Benefit Association of Canada. Omar Moreno took home his second Sovereign as Outstanding Apprentice Jockey, in the same year he won the Eclipse Award in the same category. He was 144 for 1002 with $5.3 million in earnings, finishing fourth in the standings behind the finalists for Outstanding Jockey. He credits most of his success to his agent, retired jockey Jack Lauzon. He lost his apprentice allowance on November 24 and he recorded 2 wins as a journeyman before the end of the 2010 season. In the media categories, Beverley Smith wrote the Outstanding Newspaper Story for "Silky Smooth, Not Without the Colour Man", earning her third Sovereign in this category, an award she dedicated to her late friend and popular media personality Bob Summers of the Buffalo News. Perry Lefko took home Oustanding Feature Story honours for "Horse Hugs" earning him his second Sovereign. 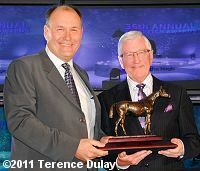 CBC Sports' broadcast of the 2010 Queen's Plate was selected as Outstanding Film/Video Broadcast, while Tod Marks won his first Sovereign with "Miss Keller and Her Bunny" as Outstanding Photograph.